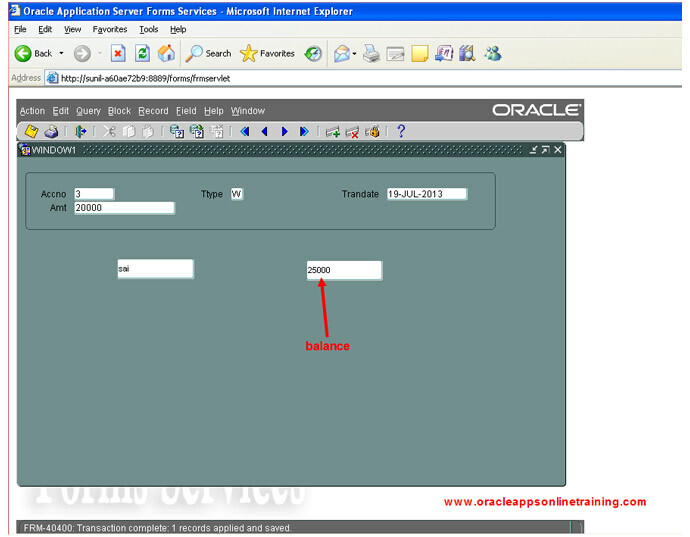 Open the form builder tool and create a new form based on bankmaster table by using data block wizard and layout wizard. Provide the following code an compile. 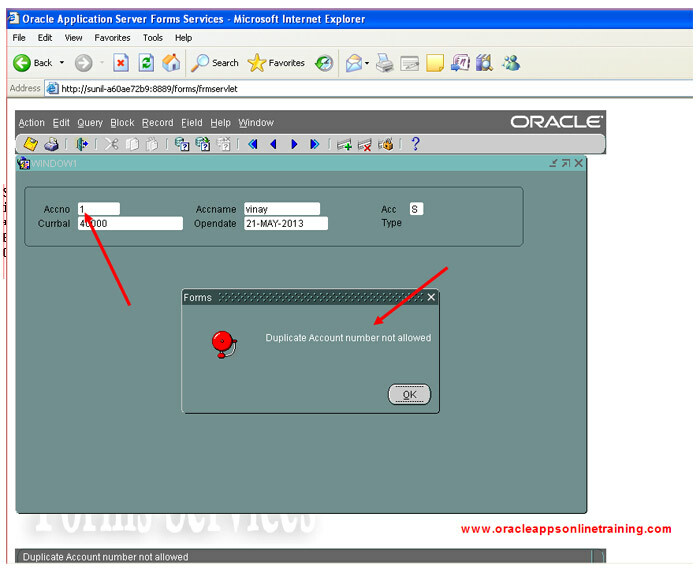 We get confirmation message " Transaction complete: 1 record applied and saved"
We get an message as "Account type can be "S" or "C" or "R" only"
In the ON-ERROR trigger which we have created, we used the if condition based on the value -2290. Actually -2290 is error which is raised at the database level for check constraint violation. By trapping -2290 error, we are able to give meaningful messages at the form level. We get an message as "Duplicate Account number is not allowed". In the ON-ERROR trigger which we have created, we used the if condition based on the value -00001. 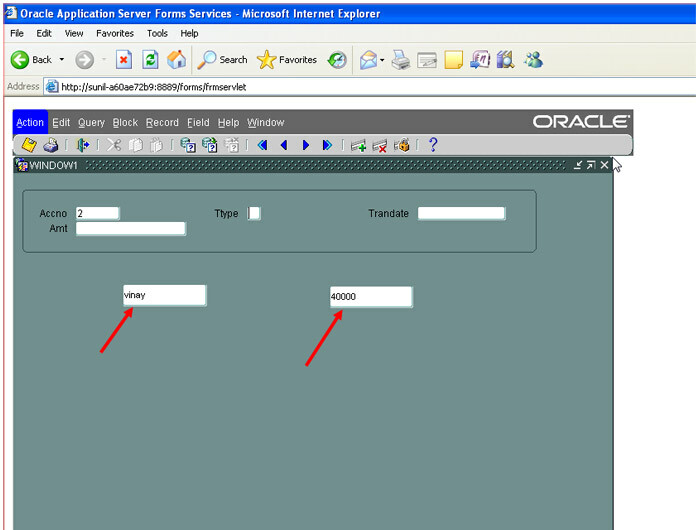 Actually -00001 is error which is raised at the database level when we insert duplicate value in primary key constraint. By trapping -00001 error, we are able to give meaningful messages at the form level. 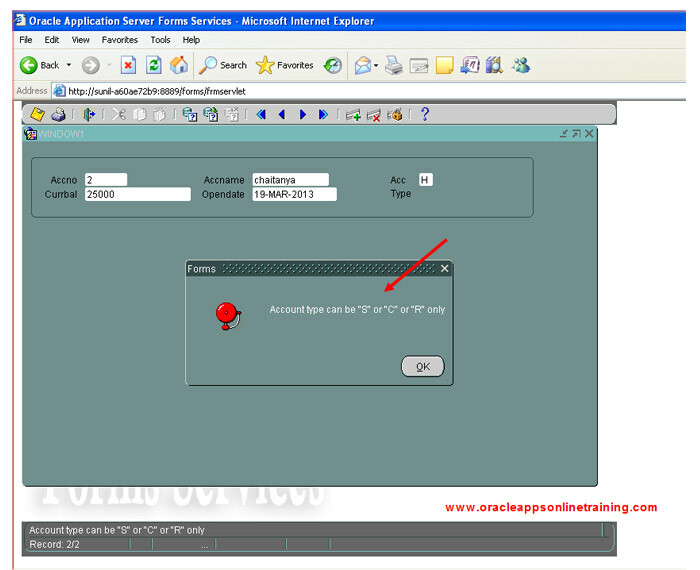 FRM-40508 , is the error raised when insert statement is failed in forms. 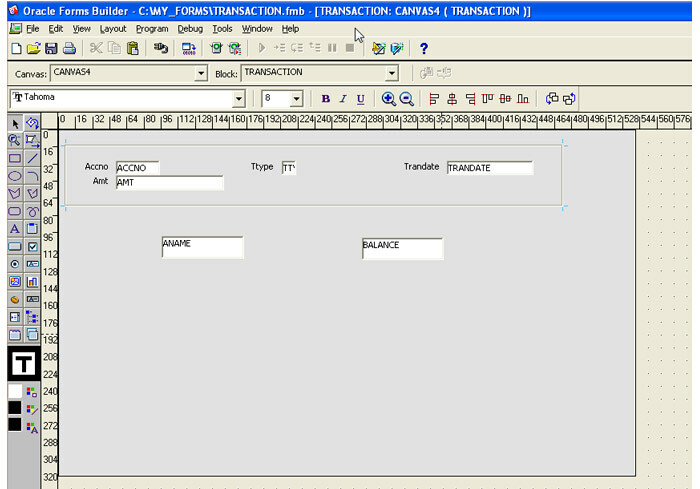 Now, let's create form based on transaction table using data block wizard and layout wizard. Go to the layout editor and place to display items. Name the display items as ANAME and BALANCE. 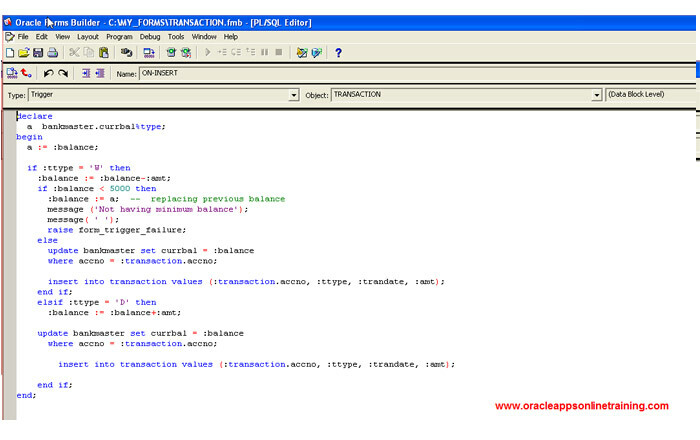 Create KEY-NEXT-ITEM trigger for the item ACCNO, provide the following code and compile. The above trigger gets name and balance into the display items. Let's create ON-INSERT trigger at the block level, provide the following code and compile. The above trigger is fired when we insert the record. 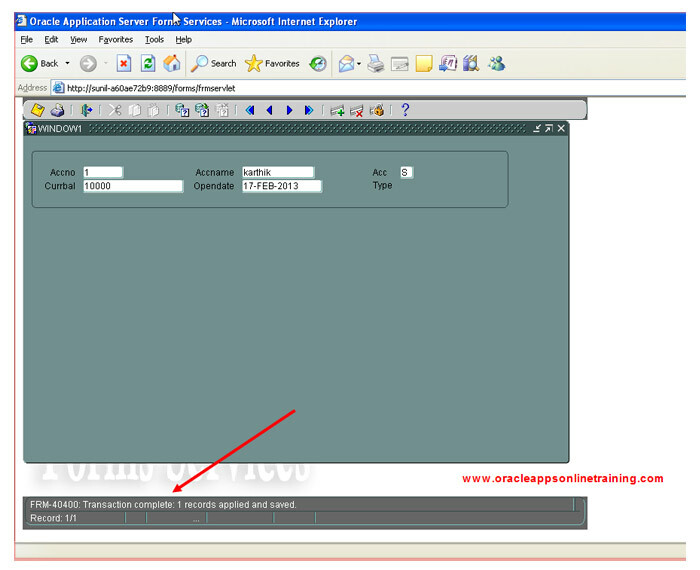 It updates the current balance in bank master automatically. provide the following code and compile. The above trigger make sure that we enter today's date only. 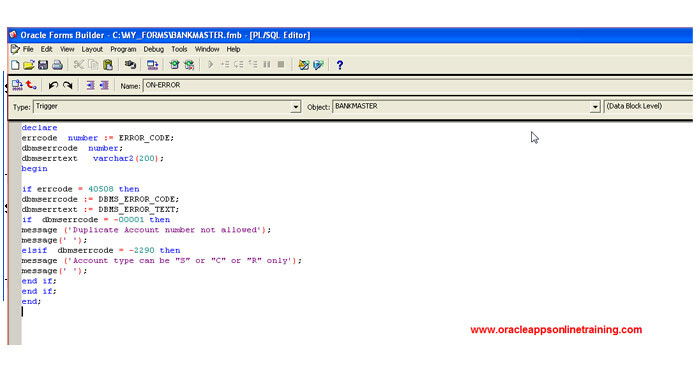 Before running the form, lets insert some more data in table bankmaster by using following commands. Look at the current status of bankmaster and transaction tables in our database. Now, let's Run the from. The KEY-NEXT-ITEM trigger will be executed and populates Accname and balance in the display items. 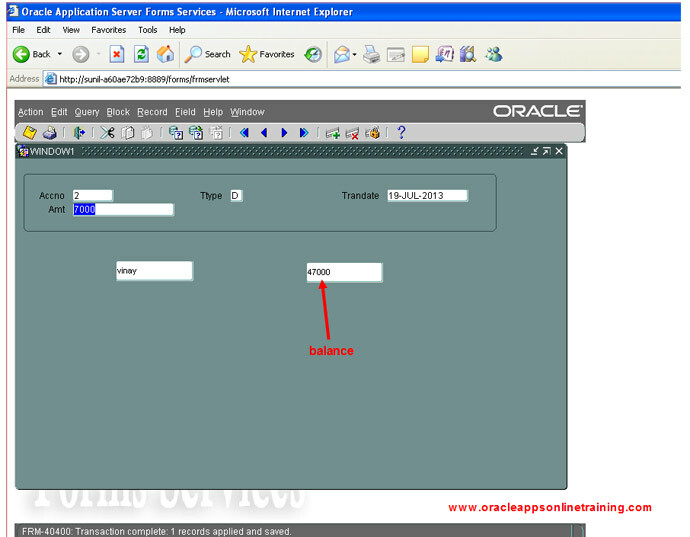 The following are the transactional triggers fired when DML operations are performed in database data block. We have another trigger ON-COMMIT at form level.